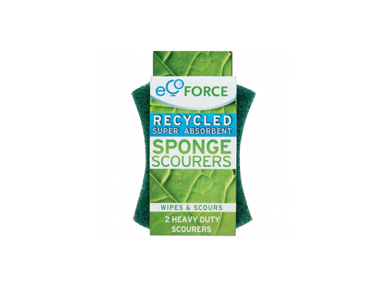 Buy Ecoforce Recycled Super Absorbent Sponge Scourers x 2 in the UK from our online shop or directly from our independent Scottish store. These scourers are made from recycled plastic, so you'll be using less plastic than with commercial brands. Ideal for if you want to reduce plastic in your life! We sell real Ecoforce and other Homeware directly from our shop in Scotland and online throughout the UK. View more products from Ecoforce. Where can you buy real Sponge Scourers - recycled safely online? If you are wondering where you can buy Ecoforce Recycled Super Absorbent Sponge Scourers x 2 safely online in the UK, then shop with us. Sponge Scourers - recycled - Ecoforce Recycled Super Absorbent Sponge Scourers x 2 in Homeware and Household.